Owning a boat requires sailors to develop a whole new skill set and take on a raft of new responsibilities, but this essential handbook takes the stress out of what should be an enjoyable, rewarding next step, and shares a wealth of practical advice on what might initially seem daunting new challenges. Drawn from more than thirty-five years of the author's own experiences, this book is packed with expert wisdom and hand-holding guidance on every aspect of owning, equipping, maintaining, sailing, and--of course--enjoying your first boat. Topics covered include: choice of boat; insurance; assessing (and costing) moorings and berths; navigation and safety equipment; domestic equipment (galley, bedding, clothing, etc); navigation (including in fog); manuevering in close spaces; sources of weather information and forecasts; responsibilities towards crew; catering and cooking; maintenance advice (daily tips, winterizing, engine servicing, fitting out for spring, etc. ); paperwork (including customs forms); dealing with emergencies; and more. Filled with color photos and diagrams throughout, this comprehensive guide is indispensable for new skippers who have learned to sail at a sailing school or on a friend's boat and are ready to take the next step. 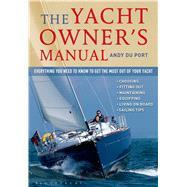 Andy Du Port is a former editor of the Reeds Nautical Almanacs. He is an experienced yachtsman, having sailed for many years along the south coast of England, the Channel Islands and the north coast of France, including southern Brittany. He is the author of Your First Channel Crossing, also published by Adlard Coles Nautical.